In a remote, piney wood in Finland stands a convalescent hospital called Suvanto, a curving concrete example of austere Scandinavian design. It is the 1920s, and the patients, all women, seek relief from ailments real and imagined. On the lower floors are the stoic Finnish women; on the upper floors are foreign women of privilege the "up-patients." They are tended to by head nurse Sunny Taylor, an American who has fled an ill-starred life only to retreat behind a mask of crisp professionalism. On a late-summer day a new patient arrives on Sunny's ward a faded, irascible former ballroom-dance instructor named Julia Dey. Sunny takes it upon herself to pierce the mystery of Julia's reserve. Soon, Julia's difficulty, her tightly coiled anger, places her at the center of the ward's tangled emotional life. This fraught dynamic animates Maile Chapman's ambitious first novel. As summer turns to fall, and fall to a long, dark winter, the patients hear rumors about changes being implemented at Suvanto by an American obstetrician, Dr. Peter Weber, who is experimenting with a new surgical stitch. Their familiar routine threatened, the women are not happy (they were not happy before), and the story's escalating menace builds to a terrifying conclusion. Maile Chapman's stories have appeared in "A Public Space," "Literary Review," "The Mississippi Review," and "Post Road." She earned her MFA from Syracuse University and is currently a Schaeffer Fellow in Fiction at the University of Nevada, Las Vegas. Sunny is an American living abroad, as are many of the “up-patients” on her ward. On page 14 the narrator states that “It’s hard to learn the language and it’s hard to penetrate the culture. It takes time to make friends in Finland. . . .It is clearly easier to come here, to the hospital, than to try to adjust.” What role does cultural alienation play in the novel? Why did Sunny choose such a remote and foreign place to live and work? Was she prepared for the challenges? On page 10, during Sunny’s first meeting with her supervisor, the Head of Nursing, she is told that, “What we want from you is competent nursing, and also patience.” A moment later she adds, “And common sense, because you’ll feel the isolation here.” Does Sunny succeed at providing those things? In your opinion, does she make any mistakes? 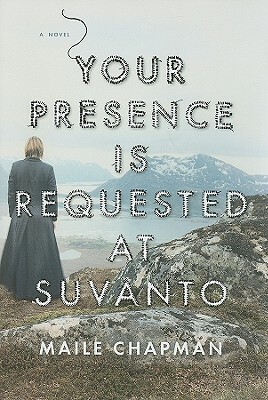 Your Presence Is Requested at Suvanto employs two distinct points of view, the first person plural and the third person omniscient. What is the purpose of the choral voice? What is the effect of shifting from one point of view to the other? Who is speaking in passages such as the following on page 99: “[Sunny’s] work is nearly meaningless, and life is nothing but a search for meaning, yes? Isn’t that right?” How would you describe this tone, and how does that affect your interpretation of events? How do the changing seasons and weather affect the development of the narrative? What role does landscape play in the book generally? Chapman often describes the aging body with unflinching precision. How are we meant to react to the degradation and failings of the body? What do you think the author is saying about her characters’ attitude toward their bodies? Before she came to Suvanto, Sunny was caring for her ailing mother. In other words, she is often in the position of attending to others without addressing the reality of her own needs. What do you think Sunny needs? Is she capable of taking care of herself? Julia Dey, the ex-ballroom dancer from Denmark, instigates much of the book’s tension. She is a menace and pest, but she can also be funny and charismatic. Did you sympathize with Julia’s predicament? Given all the trouble she causes, why are the patients so outraged by her eventual death? According to Pearl’s husband William Weber on page 212, she has “actively chosen to make herself ill. She is, as she has always tried to convince him, not like other women.” Is this is a fair conclusion? Are all of the up-patients simply neurotic? If not, what is wrong with them? Unlike many of the other up-patients, Laimi is Finnish, and she is eager to leave the institution. What is her role in the story? What is the nature of her relationship with Sunny? Despite the apparent order and efficiency and high level of professionalism at the hospital, we discover that it is as much an economic system as a medical facility. Care is not necessarily distributed equitably among those who need it on the lower floors. Does Your Presence Is Requested at Suvanto have anything to say about contemporary healthcare issues? The presence of Dr. Peter Weber, the American obstetrician who is experimenting with a new C-Section procedure at Suvanto, seems to highlight the moral ambiguity of medical progress and process. His goal is to save the lives of both maternity patients and their babies by making a dangerous operation safer, and to make the older patients “into happier people” after hysterectomies. His methods, however, probably wouldn’t be considered ethical today. Are those methods justified? Is Dr. Weber a threat, a misguided innovator, a tragic hero, or something else entirely? Dr. Weber and Nurse Frida are murdered in a moment of hallucinatory frenzy. What is the source of the rage that inspires the murderers? Although some reviewers called the novel a “thriller,” it does not really rely on cliffhangers or plot twists for momentum. How does Chapman ratchet up the tension and create an atmosphere of anxious menace? Chapman has mentioned both Stephen King’s The Shining and Euripedes’ The Bacchae as direct and indirect influences on Your Presence Is Requested at Suvanto. In particular, Chapman has acknowledged that the genre of the Gothic Novel casts a shadow over her own novel. How are gothic conventions reworked in this book?